Dozens of Cameroon’s tribal rulers have fled their palaces in the English-speaking southwest region after armed men pulled the chief of the Balondo people out of church and killed him. Separatists have abducted and killed other chiefs in the region, allegedly for collaborating with the government. At the Catholic church in Buea, southwestern Cameroon, people gathered to pray on Sunday afternoon for the late chief Stephen Itoh Esoh. A week ago, gunmen pulled the supreme chief of the Balondo people out of the Baptist church in Ekondo Titi village and shot him dead. Among those praying was Peter Njumbe, a Cameroon lawmaker. He said if the chief had listened to them, he might still be alive. The chief refused to run away from Ekondo Titi, said Njumbe. He would not abdicate from his throne because of death threats. He would only abdicate if his own people told him they no longer wanted him and that he should leave the throne, says Njumbe. The chief would not abdicate his responsibilities, he added. Strikes and violence erupted in the English-speaking northwest and southwest regions of Cameroon in late 2016, in response to the forced use of French in schools, courts and other public institutions. A separatist movement is pushing for independence under the name Ambazonia. Chief Itoh is the eighth traditional ruler killed by armed men in the southwest region within the past four months. 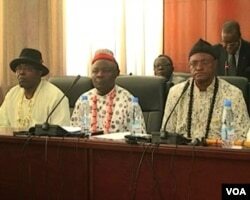 Since July, the separatists have abducted seven other chiefs in the southwest and three in the northwest they accused of collaborating with the government. They circulated videos on social media of the chiefs pledging their allegiance to armed separatists, presumably under duress. One of the abducted chiefs was later found dead, provoking widespread condemnation, while the others were released. Many traditional rulers have fled the English-speaking regions to avoid becoming targets, according to the government. Chief Joseph Ebong of Atati village escaped to Nigeria after being threatened with violence. Speaking by phone, he said he will only return to Cameroon when peace returns to English-speaking areas. “We are appealing to both the national and international community to turn their eye on Cameroon and try to see how they can solve this problem before we shrink into a full-fledged, full-scale war,” Ebong said. Traditional rulers say Cameroon's military offers them little protection. The governor of the southwest region of Cameroon, Bernard Okalia Bilai, is calling on the chiefs to return. He says the military has been deployed to defend the people, including the chiefs. The attacks on the tribal chiefs have generated widespread criticism of the separatists in Cameroon. Ebenezer Teba is a member of the elite in the southwestern town of Lebialem. He says the assaults on traditional rulers — custodians of ancestral traditions are unacceptable. Sociologist Bernard Arrey, however, blames the chiefs. He says they are getting involved in politics and taking sides against the wishes of their people. “Chiefs are meddling into politics,” Arrey said. “It is not strange to see chiefs treated like common citizens. Chiefs have lost control of their population, they have lost control of their dignity. Most of them are even victims of these fighters because they think that the chiefs are some sort a liaison, they relay information. They are some sort of a sell-out to the government forces." The armed separatists have never denied responsibility for the abductions and killings. They have instead issued warnings on social media against any chief collaborating with the government. Cameroon's government says it is counting on the chiefs to help end the fighting in the English-speaking region. The government says hundreds of people, including more than a hundred policemen and troops, have died in violent clashes since January.